Fifth-graders Mia Meredith, left, glues felt to the legs of a robotic Santa Claus as sixth-grader Matthew Flumer works on typing up a summary at the robotics club at Hartman Intermediate in Ellwood City SD. In the background, sixth-grader Paige Moffatt works on another robot. Photo used with permission from Ellwood City Ledger. 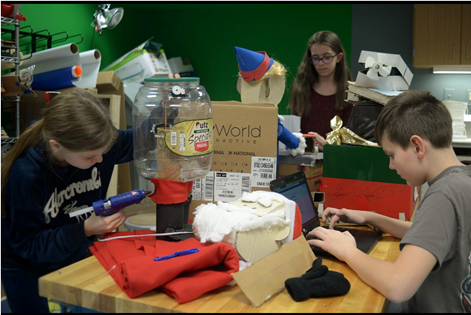 Fifth- and sixth-grade students in Hartman Intermediate’s Arts and Bots Club, led by technology teacher Matthew Skoczylas, art teacher Alan Marsh and STEAM teacher Scott Setzenfand, combined holiday fun with STEAM learning in a project involving K-6 students. The Ellwood City SD students designed and built robots based on characters from the classic movie, Rudolph the Red-Nosed Reindeer. The robots were displayed in the windows of downtown businesses near the school during a Friday evening community event, Light Up Night. At the event, students in grades K-6 had the opportunity to participate in a scavenger hunt to find the robots. Participants completed a worksheet telling which bots they found and where. They then turned the sheets into their teachers the following Monday for a chance to win a prize. According to an article in the Ellwood City Ledger, students in the Arts and Bots Club learned how to use hummingbird kits, which act like electrical brains that tells the robots what to do. The kit is attached to a microbit, which allows the bots to move without being plugged into a computer. The other parts of the robot they built out of household objects such as cardboard, empty snack containers and cotton balls. Students carefully created each robot to move in a unique way. For example, the “Sam the Snowman” bot could move its arms and “play” a banjo, just like the movie character.